Marmolada (3343 m) is the highest mountain in the Dolomites group. Because of its south face, this is such a great mountain that even in the biography of R. Messner on Wikipedia it is listed as one of his great early achievements. But the normal glacier route from the north is far less demanding, and with the installed ferrata elements on its rocky part nowadays it is achievable by anybody with normal physical conditions. In this page, I shall give you essential information which you will need before climbing Marmolada. This is a beautiful massif from any perspective and surrounded by many other nice peaks of Dolomites. The approach roads are over mountain passes with breathtaking views. Like many other mountains in the region, this mountain was also a front line during the World War I, and you will realize this, see one of the photos below. The glacier itself contains tunnels from that period. The normal north route starts at Fedaia pass. There is a free car parking at the pass and the lake, after crossing the dam. Many spend a night there, some in motor-homes, in cars, or in tents raised late in the evening. You will see the sign for Punta Penia (3342 m) at the parking. 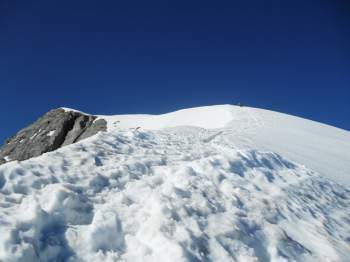 The route goes toward Pian dei Fiacconi hut (2626 m), and from there over the glacier to the summit. In late season the glacier is with little snow and only then you will realize that it is with a lot of crevasses. When I was there, there was a thick snow layer and I could not see any. But this only made me more nervous. The glacier section ends up by a rock passage of some 100 meters or more with fixed cables. You will need the usual ferrata equipment here, a harness and a y-rope. After the ferrata you are on the snow, and very soon the summit cross will be visible in the distance. This part is rather easy and beautiful. There is yet another hut only about 50 meters from the summit. View towards the glacier and the hut. 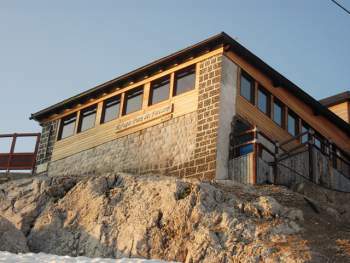 Pian dei Fiacconi hut (2626 m). 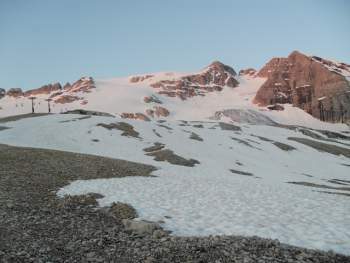 On the Marmolada glacier – view back towards the pass and the hut. The height difference from the car parking is about 1300 m.
The hole in the rock: a cannon nest from WWI. The ferrata section above the glacier. For the type of boots and crampons please see my another text. 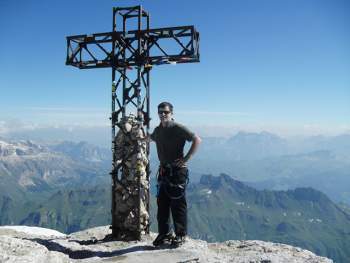 I climbed Marmolada solo, and it was just a day after my long tour to Zugspitze (see the page within this site). After descending Zugspitze, I just continued south, crossed Austria and entered the Dolomites. I had a storm most of the time, and only during lightning, I could see what kind of great scenery I was surrounded with. I arrived at Fedaia Pass (2057 m) around 10 pm, it was July 3, 2010. There, I spent the night in the car and set off for the summit at 3:50 am. The upper part of the route, below the summit. The hut just a few meters from the summit. The route was first a walk on a rocky terrain through bushes, and then on snow before arriving at the Pian dei Fiacconi hut (2626 m) at 5:50. There was no sign of life in the hut, people were sleeping. This was not surprising because not much time is needed from the hut to the summit, so a late start is fine. My original plan was to avoid glacier and to take the west ridge ferrata route. However, everything around was covered by snow, and I had no idea where to go and how to cross the glacier to get to the route. So for that reason, I decided to take a rest on a rock surrounded by snow far above the hut, and to see if somebody would appear going in my desired direction. In the end, after a long hour of waiting, some groups started moving from the hut. To my disappointment, I realized they all were going the glacier route. I decided to go the same way. There was deep and soft snow on the glacier, but there were no problems, I could not see any crevasses. I followed the trail hoping this would be safer regarding crevasses. On the upper part of the glacier, the route turned to the west and I was on the rock, where I used y-rope and harness. The ferrata part was not difficult, and it was far less exposed as compared with my experience from Zugspitze the day before. There were no many people at the summit, perhaps those that were in front of me, have already been resting in the hut which was just about 50 meters from the summit cross. But there was a young man, almost teenager, and his elderly and authoritarian father. The father was obviously in charge of everything. He was ordering the son where to stay, and which mountain to have in the background as he was taking pictures. He made his orders just by pointing fingers. The boy followed his finger obediently. I felt sorry for him, and I think he realized that. Soon, the father gave a sign and they started descending. But this was a moment for me to ask the boy to make a few photos of me, and they are here on this page. Later on the route below, I could hear the father angrily speaking to the son about something. Marmolada remains a great memory for me; I doubt it is the same with the boy. Dolomite mountains in the background. Me at the summit cross. I was carrying 3 liters of water and did not spend it all. Later somebody told me that west ridge route was under snow and that is why there were no visible trails in that direction. Back at Fedaia pass, I realized it was crowded now. Many Italian families arrived in their motor-homes. From this, I concluded that weather forecast was good. I decided to stay the night there, I was tired to continue. Next to my car were two vehicles from Slovakia, they were sitting till late in the evening playing the guitar. In the morning, I saw a few of them still sleeping in bags under the clear sky, but some of them were already preparing to go to the mountain. I left soon toward Trieste, which was my actual destination in the first place. So, this was my story from this great mountain. I wish to stress again that you need special equipment for this route. As for the accommodation, I suggest you visit my post where I give information about a few agencies which I regularly use when I go to mountains. The information they give on their sites is reliable. Please leave a comment below, it will be appreciated, and I shall be happy to give answers to any question from you. Thank you for documenting your ascent of Marmolada. Truly great read. This August I will be visiting the Dolomites and would like to find some good running routes (Up to 5hrs). I have some experience with mountain marathons here in the UK (No glaciers). 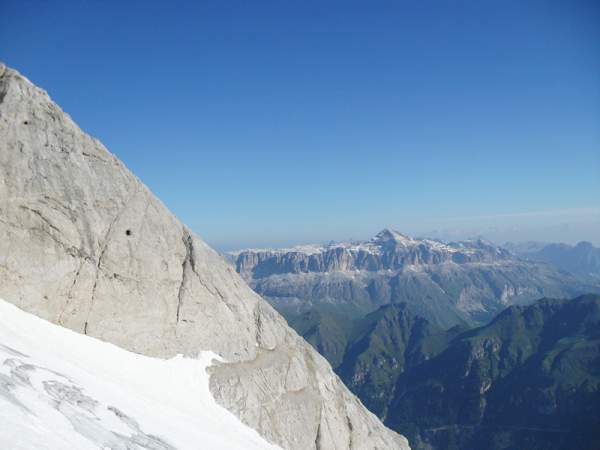 So far Marmolada looks like it would not be possible for me as I have no experience with glaciers or using ferrata equipment, would you say that is the case? If so would you be able to recommend any other mountains ideal for running in the Dolomites? Hi Matt, thank you for the kind words. No Marmolada would not be for such an activity. But there are many more. Dolomites are sharp and rocky and probably not the best environment for runners but you can certainly find such places even there. Great areas for runners are mountains around Livigno because the mountains are with mild slopes, less rocky and less steep. See my text about Monte Vago and Monte Breva so get some idea. Also Stelvio area is of that type. You can get to Piz Umbrail and several other peaks around, and this is very high. There are many more of course, dependent on the area. You might want to consider this Drei Zinnen race. Amazing Info I will look straight in to it. The Drei Zinnen race route looks absolutely incredible, I think that has to be on the list of things to do. Looking further into your site it is awesome how much detail and work you have put in to it. Very inspiring! No problem, let me know if you need any info, I know some areas in the Alps pretty well. See my text about Monte Confinale. When I was on the summit, one runner like you arrived, he had only a small lumbar pack, and he was running although this was over 3000 meters. Great reading your article! Going to the Dolomits in early September and want to hike MArmolada. Will stay in Campitello or Canazei . Can you go by your own? Or is a guide required? I have been hiking for a long time in Norwegian mountains . Did you bring a lot of clothing? How’s the temperature ? I suppose I have to bring a windprrof jacket anyway at that altitude even during early Septembre. How many hours return trip approximately? 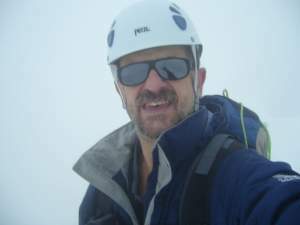 Hi Noreen, you can see images in the text, I was in a polo shirt on the summit. But you might want to read my text about clothes in general, it will answer some of your questions. I did it solo, my first and the last visit to that particular area. So I am sure you will manage it as well. There is a lot of information in the text. Plan 5 hours from the pass to the summit. great website, in depth and very informative. Exactly what I was looking for in relation to Marmolada. Just one questions though: I’m going to climb it in second week of September, with my partner. Do you think there will be much snow there? Hi Jo, thank you for visiting my site. I am sure that so late in the season the glacier will be without much snow. I was early and the snow was deep, but I have seen pictures of others and know that it can be just ice. So most likely crevasses will be open, at least you will see where you will be stepping. This should not be problem when you have a partner on the rope. It will be great to hear from you when you come back. All the best and good luck. thanks for your reply. Your website is absolutely amazing, I have been reading your posts for some time now and your I have been provided with good amount of detailed information and inspiration too. You are doing amazing job! Thank you. Many thanks Jo, your words mean a lot to me. All the best to you. Great article and many thanks for the website. We are planning an ascent on Marmolada in early June. Do you think it is wise at this time of the year? Did you make use of any maps? Is there anywhere to hire equipment from nearby? Hi Jason. In early June you will definitely have a lot of snow. This should not be a problem in principle because the glacier route is covered by snow anyhow, most of the time. So if you know the direction it is doable. But on the ferrata part, if cable is in ice you will not manage. It is not a long section but you need an access to the cable. I did not have any maps, just what I memorized from the Internet. Orientation is not a problem in general. Cannot say much about possibility for renting stuff. At Fedaia pass there are just a few buildings, I would not expect to find anything there. Perhaps in nearby valleys. It was my rather fast tour so do not have much info, sorry. How many hours do you think we should allow to reach the summit from the car park? I think the rough plan is to stay at the hut on the summit overnight and make the descent the following morning. I walked from the pass, 3:50-9:40 am. But I spent a lot of time at the lower hut waiting for anybody to move, to see the route. So it is doable in 5 hours for sure. No need to stay in the hut. 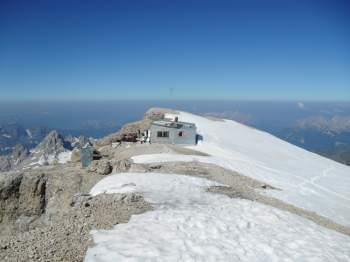 Besides, the hut close to the summit is very tiny, I doubt if they offer any accommodation. Did not enter at all. But you can stay in the lower hut, it is described in the text. I assume it will be open, there are lifts around, popular area. I do not use lifts, but you have it from the pass. WOW! Great site! I am still in the building stage. Your site showed be how it can really work. Loved all the links and reviews…great ideas. So much information on mountain climbing. It’s a great page for people who are starting out and the experienced climbers. Again, awesome site. Thanks for the ideas! Hi Trish, from your comment I understand you are not a mountain climber. Try it, you might enjoy it. All the best to you. Hello! Great information and beautiful pictures. It is something I would love to do. You managed to put together great information in a very clear and useful manner. The pictures in the post make it extra interesting. I love the colours on the website, they make everything look clean and neat. Overall I think is a very well constructed website, and I should be asking you for advice instead of commenting on your work! great! Hi Sofi, thank you, kind words form you. The point is that I was writing about my own experience, and about something I like to do, so it was a pleasure to write about this climb. It is great that you you like it. All the best to you. In 2014, I had the chance to work in Munich for awhile and was able to climb the Alpspitze one weekend. What a beautiful place! And, beautiful people. I enjoyed your trip report of Marmolada, clearly there is so much more to see. And, a big thanks for sharing many details for how to see this for ourselves. Maybe some day! Hi Brady, thank you. I wonder which route to Alpspitze you followed. I climbed it this year in August. 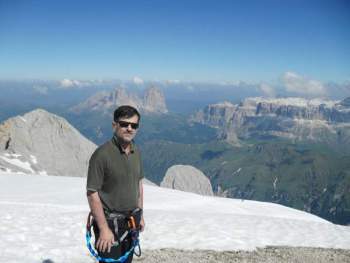 Marmolada climb was truly a great experience, so indeed do not miss it if you have a chance. Thank you Marc, kind words indeed. Any desire to join me in mountains someday? Another great and beautiful article. I can’t imagine why that father could be so demanding and angry in such a beautiful place. What a waste of a stellar father and son outing. Those huts look really fun to stay in. I’ve done quite a few backpacking trips but never to any huts. Seems like huts are used more overseas. What do you think. Thanks for the great experience! Hi Titus, thank you for the comment. Huts are very typical for the Alps and they are everywhere. There are many types, with guardian or without, some always open some not, and there are also Alpine refuges or shelters. I wrote an article about it within this site. Wow! Wonderful article, I could not imagine going on such a trek myself. Those are some incredible pictures and is inspiring me to go out and try mountain climbing! Do you find it more enjoying doing solo climbs or with a partner? I think solo climbs really allow you to contemplate and clear your head and really immerse yourself in the environment. Hi Mark, thank you for reading the text and for the comment. In fact I do not have a partner so those are mainly solo climbs. Your articles are always amazing to read, and even better to view, as the pictures are stunning. I’m not a climber myself, but I love hiking, so I generally stick to hills, more than huge mountains. However, I do love reading about them, and continue to enjoy your writing. Keep it up! Thank you Todd, great that you like my texts. I do write about hiking as well, see my page about Tenerife with a lot of articles about hiking on the island. Thank you Dan. I did not have chance to put my feet on Rockies yet, hopefully someday. Best luck. One of my dreams is to travel the world and have great experiences that are new and unique to me. The biggest mountain I have ever climbed to date is one of the local mountains here in Arkansas, that I frequently hunt. I want to see what the world has to offer though and this mountain looks absolutely beautiful! The pictures of you on the summit are amazing. It is definitely something I would want to view on my bucket list. When I am able to start my mountain climbing experience, would you suggest this as a first mountain, or would their be others that are just as beautiful that may be better learners to climb? Thank you for a beautiful post and the amazing scenery! Hi Sheena, thank you for the comment. The Alps are full of God’s masterpieces, I am sure you will enjoy wherever you go if you open your soul to the beauty of mountains. Marmolada is one of great and you will not make mistake if you go there. After many years of hiking (or mountaineering) we have gone from day hikes, to multi day hikes with overnight stay in refuge and tent. In those years we have moved gradually to more demanding terrain and crossing snow fields, scree, scrambling is part of our hikes. 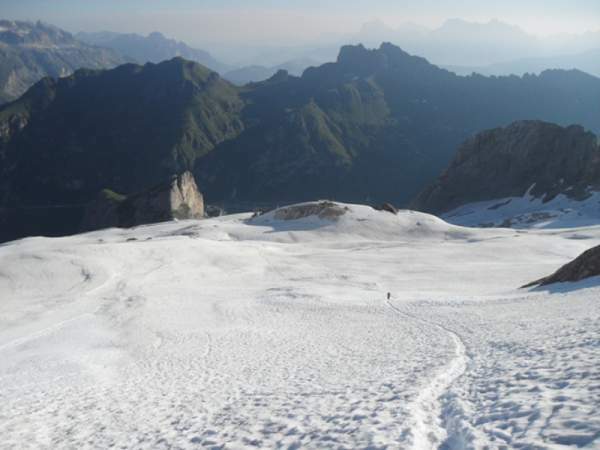 We will hike Alta Via 4 this year and I was wondering whether Marmolada is achievable and sensible. My doubt is due to the glacier with the crevasses. We have little experience on glaciers, only some experience walking with crampons. We are considering taking a alpine course next year, but for this year I am in doubt what is sensible. 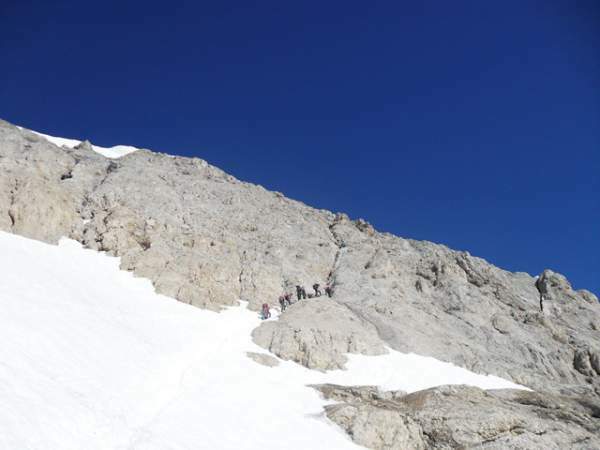 If your read what the guides write regarding to the ascent of the Marmolada you get the impression that without a guide every step may lead to sudden death. I know what mountains are not without a risk, but it seems a bit over the top. We don’t have a rope and based on our lack of experience, i think it does not make sense to have one before we know how to use it. What would you recommend? Can it be done with common sense, caution and an “appropriate ego”. Or better to use a guide till we learn how to rope up and perform crevasse rescue? Hi Helen, it is great to read your comment and about your plans for Marmolada. You may have read my story of climbing it. In addition to it, and going through your lines, I would not even think of looking for a guide. The access is straightforward, the glacier normal route is rather popular, so just follow the trail. You have been in mountains, so just common sense and the equipment described below. I am sure you will manage it and you will be happy with your achievement. The first week of July, you will probably have a lot of snow so crevasses will be covered. I did it solo, and I saw people even in groups without a rope. One section is ferrata, so you will need a harness and lanyard (for each person), and crampons. Now, since you will have a harness, you may have a peace of rope if you wish so, to connect with your companion, 20 meters may be perfectly enough. This may give some feeling of protection and you do not really need to be an expert, keep the distance between you two, and keep an eye on your partner if you are on the back position. To attach the rope you need nothing extra, a simple 8-shape knot will be perfect. I wrote about equipment on a separate page, and about crampons you may see this post. Please do not hesitate to contact me if you have additional question.